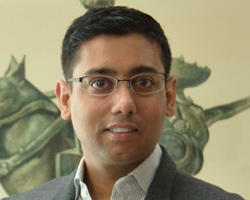 Mr. Pankaj Agarwal is the CEO at TagHive - a Samsung spin-off on a mission to make kids play more creative, social and fun. He is an inventor on over 45 international patents and was selected as one of the Top 10 Innovators in India in 2017 by MIT Technology Review. Prior to TagHive, Mr. Agarwal was with Samsung Electronics where his decade long career spanned across several professional capacities - hardware circuit engineer, strategic innovation manager, and an advisor to the CTO of Samsung. Mr. Agarwal is also the founder and Chairman of the IIT Alumni Association of South Korea and holds the Chair of Smart Cities initiative at the Indian Chamber of Commerce, Korea. He is also a trained magician and is fluent in Korean. He has a Bachelor of Technology degree in EE from IIT Kanpur, MS from Seoul National University and an MBA from the Harvard Business School.